The need to select quality food for tropical fish cannot be overemphasized. Many common fish ailments can originate in the little jar of fish food that you, unknowingly, pick up on sale. But it's hard—even for the most experienced fish fancier—to know whether a food is satisfactory until you give it a thorough test. By that time, you may have already ruined the aquarium with the wrong food. How, then, can you navigate the important task of maintaining your fish's vitality? It's simple: Just pay more attention to the ingredients contained in the food and less to the price and marketing on the label. All living things need balanced nutrition to both survive and thrive. Take, for instance, Vitamin D, a nutrient recommended for tropical fish. Proper amounts of Vitamin D, as well as other vitamins, need to be present and also absorbable in order to have healthy fish. A properly blended food, rich in proteins, carbohydrates, minerals, and iron will contain all the vitamins necessary for your fish to live happy, healthy lives. 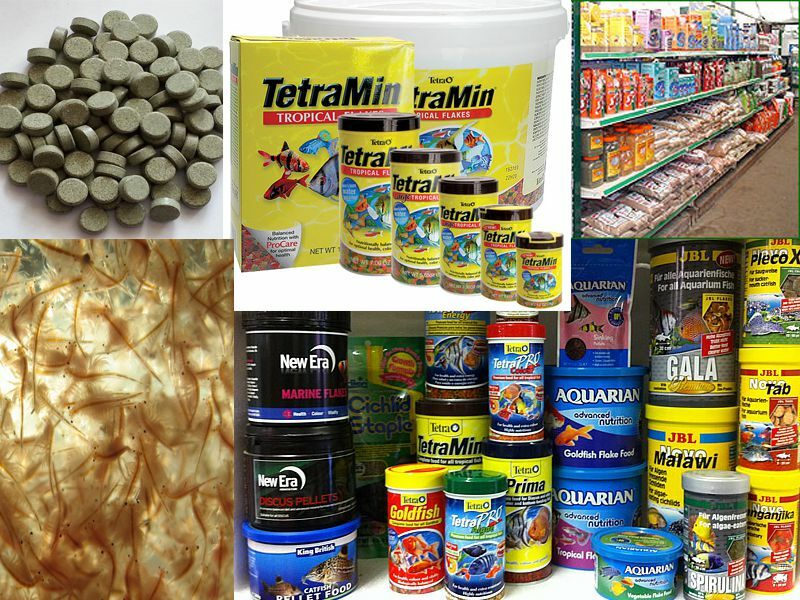 Buy a reputable and well-established "staple" food that works for most, if not all, of fish in your tropical aquarium. Ask your pet store manager for a recommendation on brands before snagging just anything off the shelf. Then, feed your fish twice a day (no more) and with an amount that they can finish completely in 5 minutes or less. Just because your fish gobble up their food, doesn't mean it's good for them. The fact is, most fish aren’t particularly choosy. If you tear off a piece of the bread and throw it in the tank, they'll probably attack it with fervor. It may be very bad for your fish, yet very palatable to them. A good fish food needs to be both balanced and palatable to the majority of the fish in your tropical aquarium. Again, ask for recommendations at your pet store, and then test the food for a few days to see if your fish like it. If they do, use that brand as your staple food. You can't just grab a staple food for your tropical aquarium and call it good. If you have various kinds of catfish or other vegetarian varieties of fish, you need to add spirulina to their diet. Spirulina (blue-green algae) can be purchased inexpensively at pet stores and comes in round sinking tablets. Just drop one or two in the water, let them sink to the bottom, and watch your vegetarian fish consume them. Mollies are particularly fond of this treat. Just like you, your fish appreciate a varied diet. Freeze-dried live foods that contain krill and bloodworms work well for an occasional treat, as do frozen brine shirmp—the "ice cream" of fish desserts. Supplementing their feed in this way—with spirulina, freeze-dried treats, and the occasional frozen brine shrimp—makes for a healthy tropical aquarium. From time to time, you may want to test one of the new fish “superfoods" that comes to market. The best way to do so is to first purchase a pair of cheap fish, isolate them in a separate aquarium, and feed them exclusively with the new food. Watch their condition. If the results are satisfactory—like if they grow faster or larger, become bright in color, or display whatever enhancement the superfood promises—you have found a great food. Use it in your big tank. You may find, however, that your new fish don't grow much at all or that their color stays the same on the new superfood. Just like human supplements that seem "too good to be true," fish food can also claim certain result and then not deliver on them. The best advice is to stick to brands that have been around the block in order to ensure healthy fish.